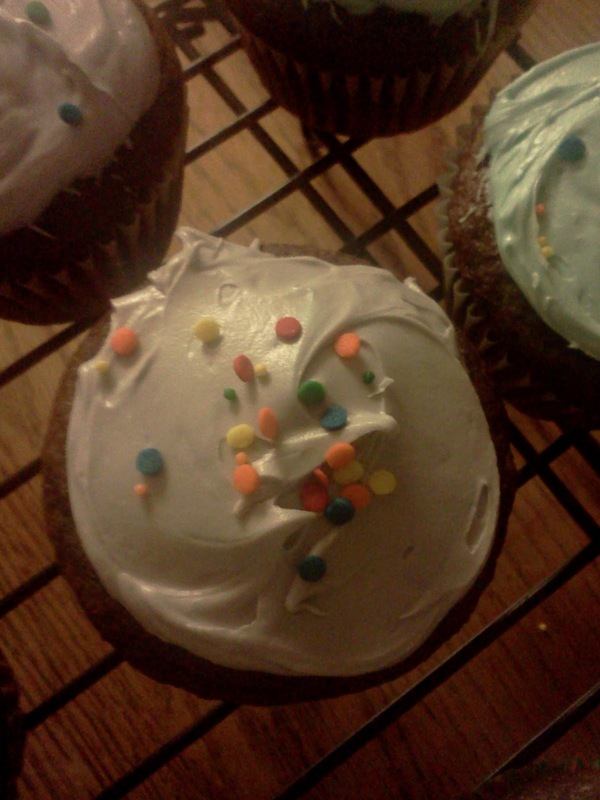 to lick the icing off, don’tcha? Who doesn’t want to drown their sorrows in chocolate? Heck, who needs sorrows to eat chocolate? Any excuse is valid for that rich, warm, fudgey, goodness. So today, the second schoolwork was done and forgotten, I made chocolate cupcakes. Mixing it in the bowl is just heavenly, isn’t it? The thick batter swirling about and that wonderful smell that greets you. You’re insane if you don’t lick the spoon. (Yeah, yeah, we all know it’s bad for you. But if you think about it, so is dessert. Sooo . . .) The batter is delish. A little sandy from some powder that wasn’t completely mixed in, but that’s the way it’s supposed to taste. Ohhh yeah. I don’t know about you, but I have fantasies of diving into the bowl and falling asleep there. I have a lot of daydreams while I’m in the kitchen. Cooking has a calming effect. My daydreams might also explain why I take so long to bake something so simple. But oh well, it makes me happy. Until, of course, my daydreams are rudely interrupted. It’s a little dark. My lighting wasn’t the best. 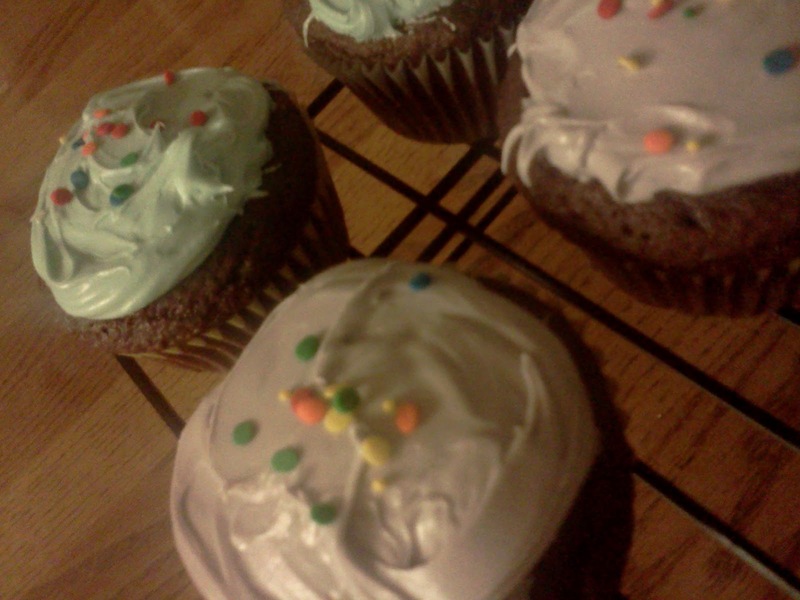 The cupcakes turned out beautifully. So beautifully, that I wanted to ice them. I was going for a deep, kind of, sky blue color, but it turned out pale. Even the purple I tried came out pale. Must be our food coloring or something. The frosting was white vanilla. It’s best with devils food cake. (In my opinion) And, for a nice little touch, I added sprinkles. I spent the rest of the evening stretched over two chairs, wearing my dirty apron and scraping and licking the left over icing that coated the bottom of the bowl. This was a good day.